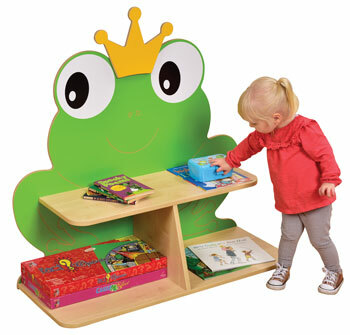 Stimulating shapes and colours from Enviro early years range are perfect for playgroups, nurseries and reception classes. 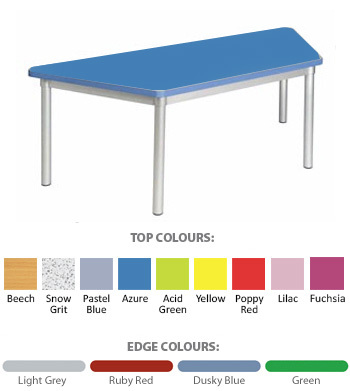 Choose from a range of primary colours with contrasting ABS edging to brighten up the learning environment for young children. 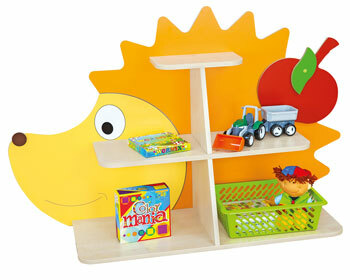 Enviro products are truly child friendly. Stimulating shapes and colours from the new Enviro Early Years range are perfect for playgroups, nurseries and reception classes. 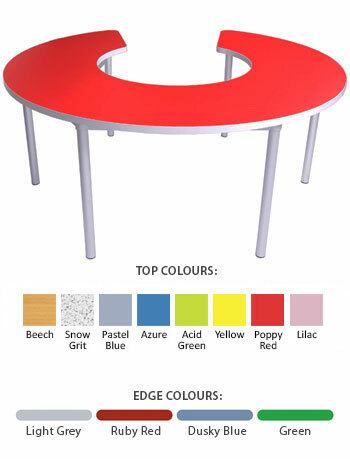 Choose from a range of primary colours with contrasting ABS edging to brighten up the learning environment for young children. 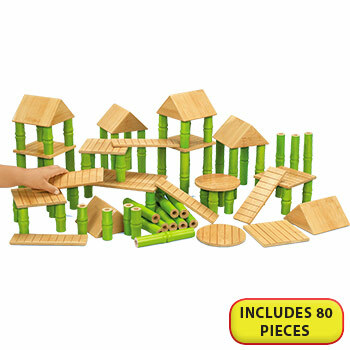 Enviro products are truly child friendly. 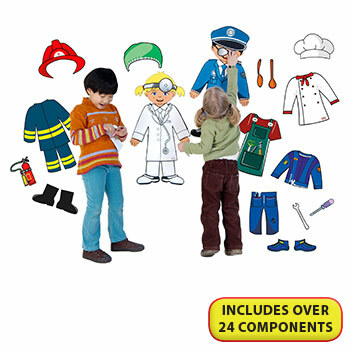 Supplied flat-packed. Legs can easily be attached the supplied allen key. 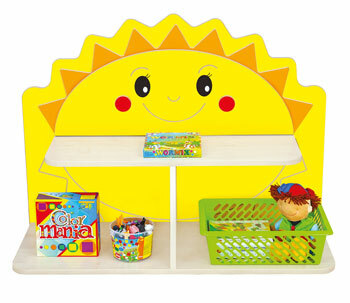 Create a stimulating and exciting learning environment with this Enviro Bean Table. 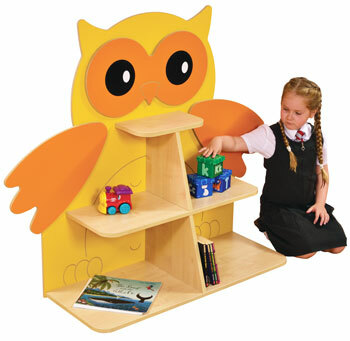 A great shape which allows children to gather around one side of the table and the teacher or playgroup leader to sit at the other. Available in a selection of bright colours and edges on a lightweight silver anodised aluminium frame. 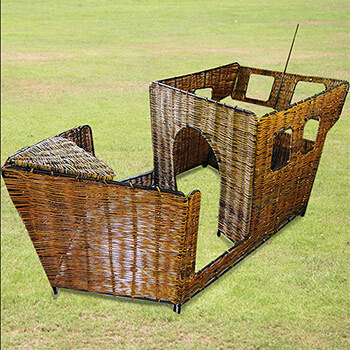 Supplied flat-packed. Legs can easily be attached using the supplied allen key. 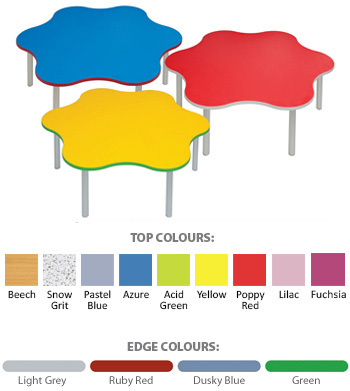 Create a stimulating and exciting learning environment with this Enviro Rectangular Table. 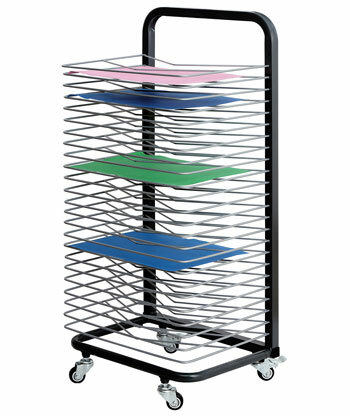 Available in a selction of bright colours and edges on a lightweight silver anodised aluminium frame.! 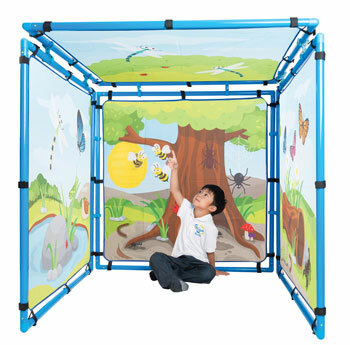 Create a stimulating and exciting learning environment with this Enviro Trapezoidal Table. 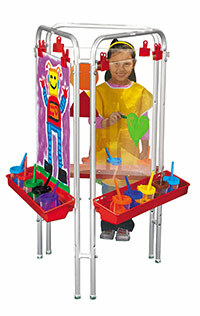 Works great on it's own or put two tables together to create a Hexagonal work space. 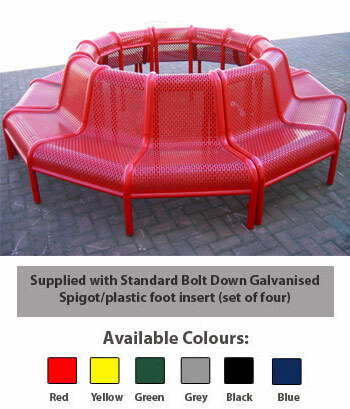 Available in a selction of bright colours and edges on a lightweight silver anodised aluminium frame. 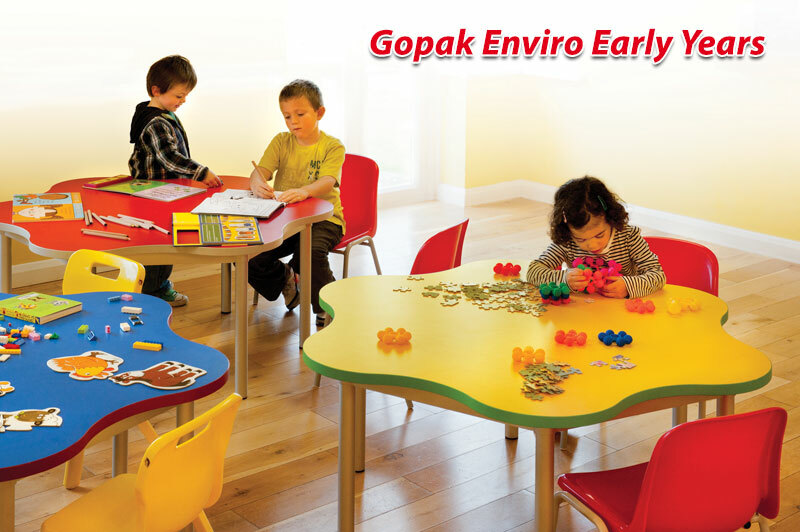 Create a stimulating and exciting learning environment with this Enviro Round Table. 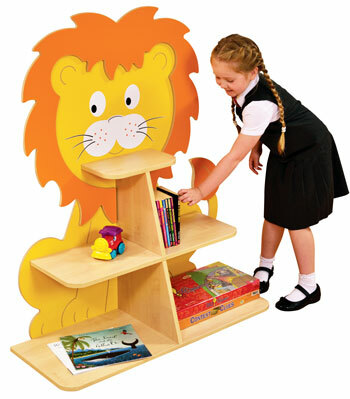 Available in a selection of bright colours and edges on a lightweight silver anodised aluminium frame. 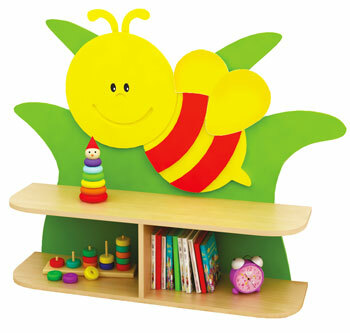 A really socialable shape for your Nursery or School. Create a stimulating and exciting learning environment with this Enviro Keyhole Table. 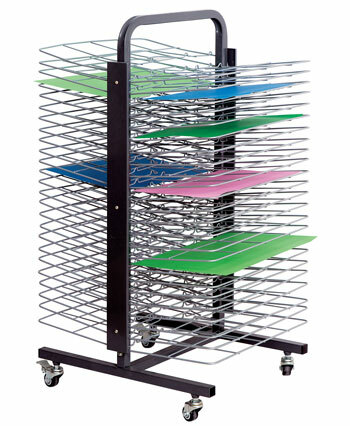 Available in a selection of bright colours and edges on a lightweight silver anodised aluminium frame. 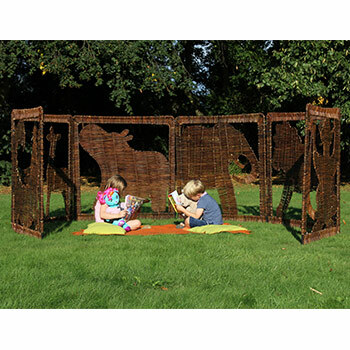 A really socialable shape for your Nursery or School. Perfect for teachers. Meets British standard BSEN1729. 5 year guarantee. 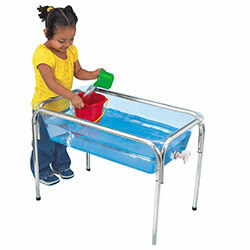 Create a stimulating and exciting learning environment with this Enviro Triangle Table. Works great on it's own or combine more tables together to create various configurations. 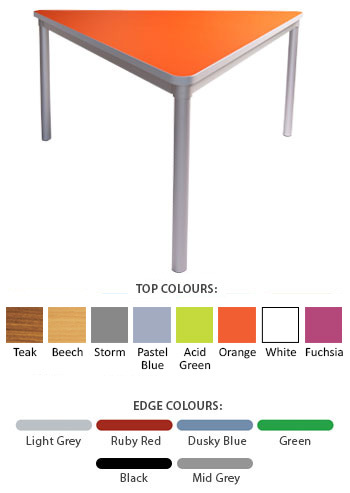 Available in a selection of bright colours and edges on a lightweight silver anodised aluminium frame with ABS edge. 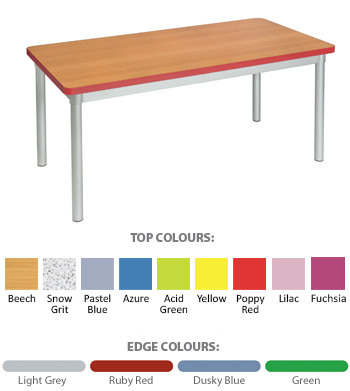 With 4 heights to choose from - 460mm, 530mm, 590mm and 640mm you can find the right table for your needs. 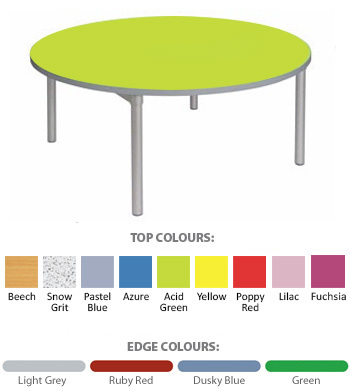 Features a lightweight silver anodised aluminium frame, ABS edge with tough hard wearing laminate top in variety of bright colours.